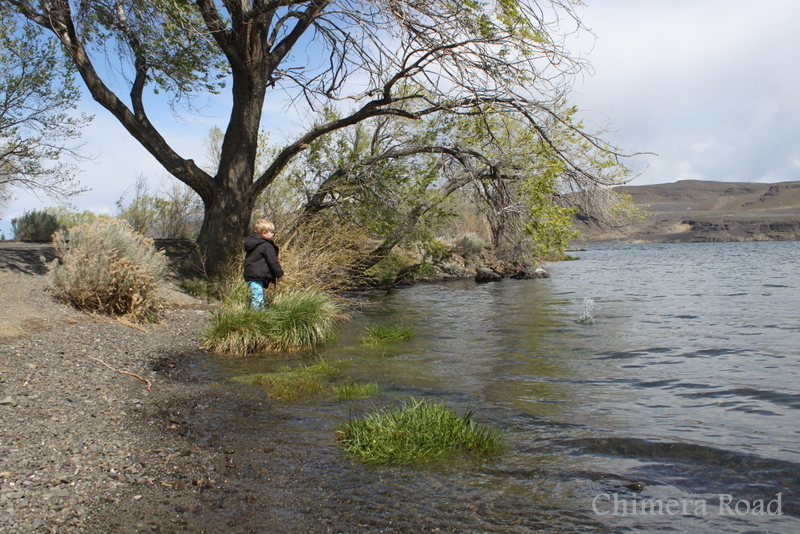 The Columbia River – not the ocean, but still a very large body of water! This is the first time I’ve stopped on the Western shore. Usually we pull over and smell the sagebrush at the Eastern side rest stop. Munchkin didn’t mind, he quickly put some of the rocks on shore to good use. Port Townsend is the place I’ve come back to year after year, starting when my parents divorced, and it’s a place that has come to mean comfort. Relaxation. Home, even though I live in Missoula. My craziest stressed out self yearns to slip away to Port Townsend the way an addict craves a fix. Life is different there on the peninsula – at least to this mainlander. Traffic is slower by necessity. Winding two-way roads and thick vegetation mean you rarely go more than 60 mph. 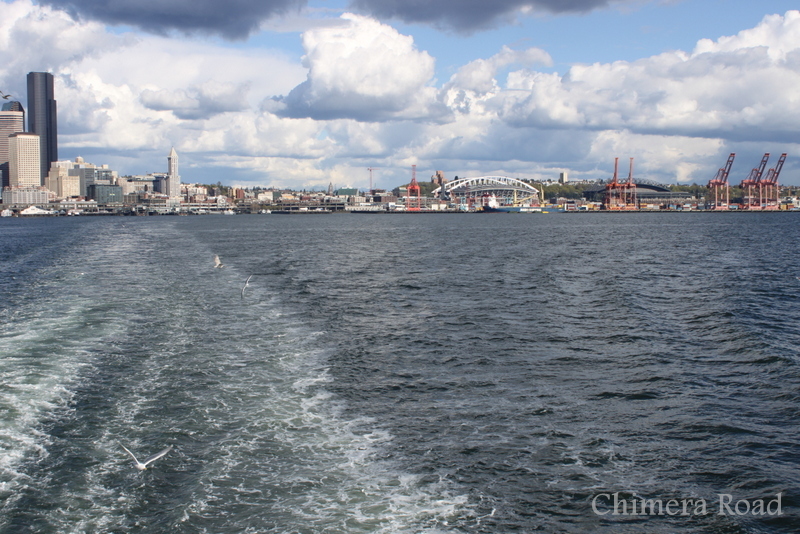 Seattle docks from the deck of the Tacoma, on our Bainbridge-bound ferry leg of the trip. We usually drive 65 mph on long trips no matter what the speed limit to maximize our gas mileage, but the rest of the world doesn’t see things our way. Sport cars, SUVs and tractor trailers alike speed past. We note the 400 mile mark on the odometer, fill up the gas tank and grin at each other, and get back on the road. Despite our pacing though, I still feel the kinks in my shoulders unknot as we drive off the ferry and wait for the first light to change to green – the light that sometimes makes it necessary to wait through a few changes so the ferry can completely unload. Two lanes of traffic merge to one without impatient cutting, and we are on our way to get up close and personal with the seaside. 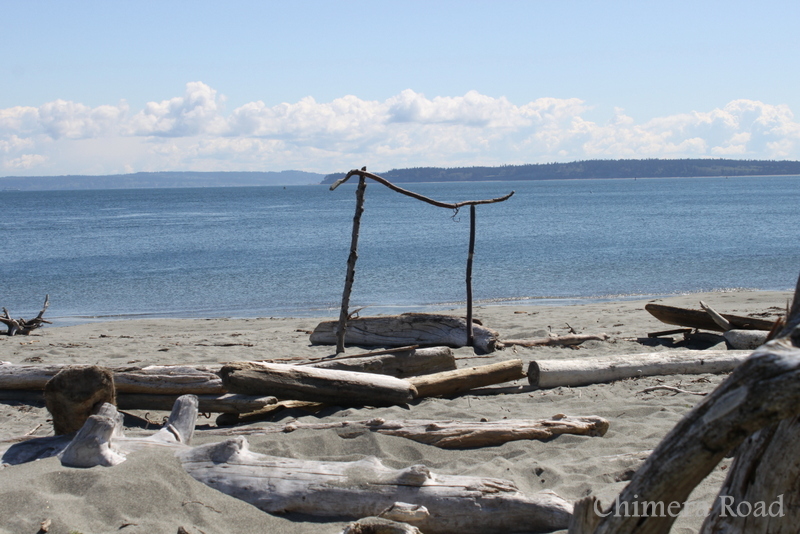 Someone built this arch on the beach at Fort Worden. You can actually find lots of these type of things – we found a zen-rock structure on another day. They’d found just the right sticks for it. This year all Munchkin can talk about is the “big boat named Ferry!” and I reassure him that we’ll ride it again soon. In the meantime, we retrace the steps that we take each time we’re here. Finding Waterfront Pizza, peering into the cases at Elevated Ice Cream (how I treasure the local ice cream shops we find when traveling! I’ve decided to start collecting their postcards.) and making our slow way down to the sand to dig our toes in. We bring it home in the crevices of the sand toys and underside of the picnic blanket and smile as we shake out a little bit of Port Townsend to merge with our Missoula soil. 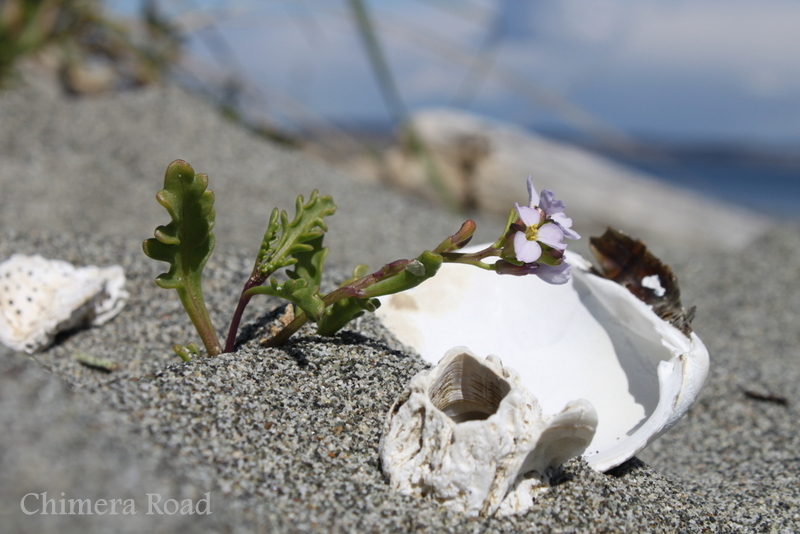 Okay, so I arranged this one, but I loved the juxtaposition of the bleached shells with the tiny purple flower. Like the sand, the town sticks in my soul. Kota, I am too a Sagg and the place I feel most grounded is standing/floating in a body of fresh water or staring out into the Big Blue. It’s because it’s our opposite! Looking for all the artwork? It’s moving to a new website that is currently under construction. Feel free to email and ask me about it! In the meantime, many of my prints are available in my Etsy Store. I take limited commissions as time and creative fit allows. Prices vary depending on the size and complexity of the proposed piece. Please feel free to share posts, images, or other content with credit and a link back to my site. Please leave existing watermarks intact on images and artwork. Looking for a writer, editor, or other support services? I’d love to chat with you. Book a free discovery call at my VA website: dakotanyght.com.